The basic paradox of a Tibetan restaurant is that Tibetan food is, to put it kindly, simple and unpretentious. To put it unkindly, it mainly consists of greasy meat and tsampa (a kind of bread). So how do you make it interesting enough to keep restaurant punters rolling in? One answer is to adopt elements from neighboring cuisines, mixing in traditional Chinese and Indian flavors. That's what Tibetans do back home and Gesangmedo adopts the same approach. Another way is to make your restaurant space an irresistible attraction. Gesangnmedo reflects the genuine passion of its owner for Tibetan art and culture. 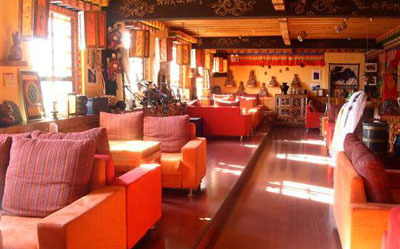 The interior is the nearest thing you will find to an authentic Tibetan inn this side of Sichuan, with beautiful wood-beamed ceilings, dazzling colors, ornate carvings, sculptures, paintings and prayer flags look like the real thing because they are the real thing, collected by the owner on his annual pilgrimages to the west. Every night there's a floor show of Tibetan song and dance. And of course there's yak butter tea. Try it once.